Ask about our monthly discounts and special pricing! Welcome to Thermal Imaging of OC Southern California’s leading healthcare imaging service. We specialize in an innovative, safe alternative to conventional body imaging and health screenings. Our personal and professional services provide diverse body imaging choices for men, women, and children; a Full Body Scan, a Partial Body Scan or Breast Imaging. Thermography is a reliable method to detect the signs of medical conditions before they become a problem allowing you to make changes that will help your body heal. Thermography, also known as Thermal Imaging, is safe, comfortable body imaging without the harmful effects of radiation, the uncomfortable consequences of pain or the effects of anxiety triggered by other imaging devices. Using ultra-sensitive, digital, medical infrared cameras and high-tech computers, this procedure produces high-resolution images of temperature variations in our body. These variations in temperature can disclose and reveal signs of existing illness up to 10 years before other imaging and testing methods such as mammography, x-ray or MRI’s. Thus, allowing time to take action making preventative treatment and lifestyle changes possible. It’s all about the skin…. Our skin temperature is regulated by the part of the brain that also controls the blood flow to every muscle, organ, and gland in our body. Based on the principle of metabolic activity and vascular circulation, Thermography can identify underlying conditions that lead to disease caused by inflammation, pain and injury. The bonus… Thermal imaging can detect and reveal our body’s current health status recognizing the precursors to disease early on while it can still be safely and easily treated. Thermal Imaging is the ONLY imaging test that can show inflammation, pain, lymphatic congestion or the effects of radiation. Thermal Imaging is the ONLY imaging test that has Predictive Ability. 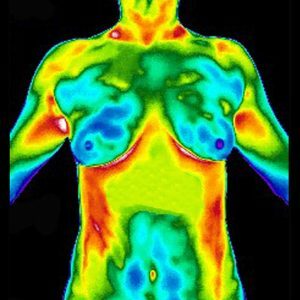 Thermography can detect conditions including unexplained pain, digestive disorders, hormone imbalances, back injuries, breast health, skin abnormalities, arthritis and so much more. This is especially helpful in alerting your doctor of changes that could indicate certain disorders. We offer diverse body imaging choices to best suit your health care needs. Call 714-392-0307 for your free consultation. Cranial, Thyroid, Periodontal, Carotid Artery, Breast/Chest, Lymph Node Activity, Hormone Activity, Full Spine, Intestinal Tract, Gallbladder, Liver, Kidneys, Uterus, Ovaries (F) and Prostate Gland (M). Incorporates the Partial Body Imaging plus Arms, Legs, Hands and Feet. “It’s simple, let’s compare Thermography to looking at the lights on your car’s dashboard. We cannot see into our car’s engine, just as we cannot see into our bodies. But, when the lights on the dashboard light up, they warn us something is about to break down or fail. 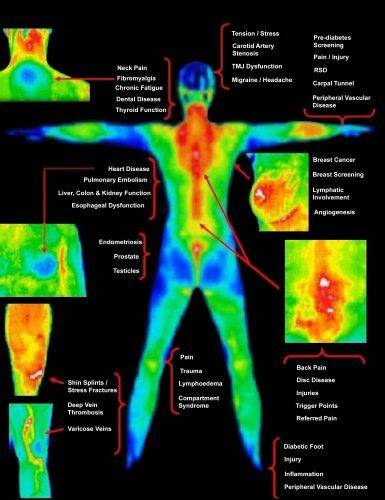 Medical Thermography is a simple test of physiology that relies on the sympathetic nervous system to respond to and react to pain, injury, pathology or dysfunction anywhere in the body. Doctors use Thermal Imaging for diagnosis and prognosis as well as monitoring therapy progress for conditions and injuries. A Full Body Scan can identify the underlying conditions that can lead to disease and is the ONLY imaging test that has Predictive Ability. Take the guesswork out of your health concerns, see beyond the symptoms and have the peace of mind you deserve. Early detection is the key benefit to proper health care and prevention IS the cure. Take advantage of the benefits of Thermography and make it part of your regular healthcare practice. A complete Thermography test requires about 45 minutes with the client. Experience the Capabilities of this Powerful Alternative. Thermography is approved by the FDA and many other leading healthcare Councils, Associations and Academies in the medical field. Thermography is a state-of-the-art and potentially life-saving method of detecting the precursors to cancer and other diseases by using Digital Infrared Thermal Imaging. Copyright 2017 Thermal Imaging of OC	Unite Theme powered by WordPress.